50 thru 235 models having battery cables separate from the instrument cable assembly. OMC Sea Driveâ power systems. This wiring kit provides the key switch , instrument cable, a warning horn and tachometer plug. It replaces the single lever control and wiring harness shipped with the unit. This kit must only be used with a remote control that has start-in neutral protection. Check contents of kit and familiar with new parts to be installed. Read installation instructions completely before starting work. Disconnect battery cables from battery. Failure to disconnect battery cables could result in motor starting accidentally. Select a location on boat dashboard for ignition/primer switch panel (A). Be sure location selected has clearance behind dash for switch (B), warning horn (C), and cable (D). Use bezel (A) as a template to mark dashboard for drilling. Drill a 1-1/2 in. (38 mm) hole for ignition/primer switch. Drill two 3/32 in. (2.4 mm) pilot holes for panel mounting screws (J). Insert switch through hole from rear of dash and pull cable out about 12 in (30 cm). Route remote control neutral start leads through hole from rear of dash. Connect neutral start lead ring terminal to start "S" terminal of ignition/primer switch. Connect other end of knife terminal to instrument cable yellow/red lead knife terminal (F). Pull rubber sleeve over connection to prevent shorting. Place panel (A) on ignition/primer switch and secure with nut. Fasten panel to dash with screws (J) provided. Note: Insert key into switch after battery connections have been made. As required, select a location on boat dashboard for the warning horn and bezel (C). Be sure location selected has clearance behind dash for warning horn (C), and cable (D). Three wire plug (E) at dash end of instrument cable is provided for BMCA plug-in tachometers and plug-in adaptors. Use warning horn bezel as a template to mark dashboard for drilling. Drill a 2 in. (50.8 mm) hole for the warning horn. Drill two 3/32 in (2.4 mm) pilot holes for the bezel mounting screws. Insert warning horn far enough through the hole to allow installation of the warning horn to the bezel. Secure the horn to bezel with screw (A). Fasten bezel to dash with two bezel screws (B). Fasten instrument cable (C) to rear of dash wit closed clamp, screw and nut provided. Note: Do not allow ignition/primer switch terminals or warning horn terminals to support cable. Route the instrument cable to rear of boat along gunwale. Fasten the cable in place with four screws and J-clamps provided. Provide sufficient slack at transom to permit steering and tilting of motor without binding. Remove cable clamp from front to lower motor cover. Route the battery leads through the opening in the lower motor cover where clamp was removed. Connect the positive (+) lead to the starter solenoid. 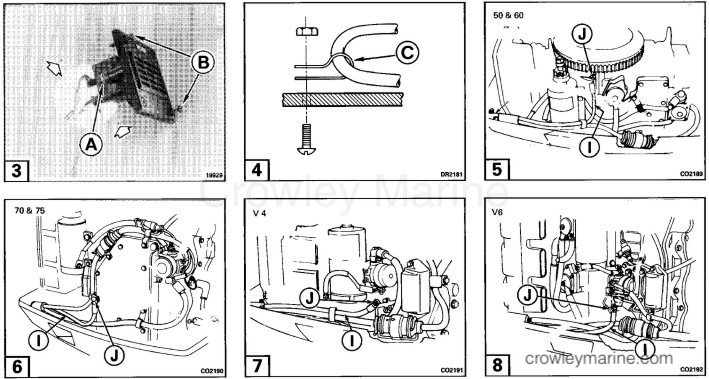 Note: On 50 and 60 models, the positive lead (+) should be routed behind the starter motor. Connect the negative (-) lead (I) to ground terminal (J). Apply Triple-Guardâ grease to connector as shown. Align arrows (L) on motor and instrument cable connectors and push connectors together. Install clamp to retain connection. Snap the clamp into spring clip. Install grommet (N) on battery leads and instrument cable where they enter front of lower motor cover. Place grommet in opening in front of lower motor cover. Install clamp over grommet. Fasten battery leads and instrument cable together, using tie straps provided, between front of motor and battery. 1. Route instrument cable through air duct bellows towards port side of engine. 2. Apply coating of Triple-Guardâ grease to instrument cable connector and push connector into motor cable assembly. Install connector clamp. 3. Remove clamp and grommet from air silencer bracket. Press fuel hose and electrical cable into grommet locations. 4. Place clamp over grommet and install screws to attach clamp to air silencer bracket. 5. If battery cables fit loosely in grommet, wrap rubber or flexible insulating material until cables fit snugly in grommet. Check routing of cables on engine for clearance near moving parts. Turn engine fully from side to side to check for correct cable length between clamp on air silencer and clamp inside boat transom. It cables rub heavily o edge of transom opening, adjust length or apply protective wrapping to cables. Note: Refer to the Owner's/Operator's Manual or Service Manual for battery recommendations, installation and serving procedures. Position battery in boat so that cables will have slack to clear steering attachments when engine is tilted and turned through all positions. Place battery in a battery box. Securely fasten box to the boat so it can not move. Be sure battery box has provisions for venting the gases generated when charging the battery. The gases emitted by a battery charging are explosive when confined. Note: Connect red lead to the positive (+) battery terminal. Connect black lead to the negative (-) battery terminal. After installation is complete, check for possible interference between electrical cables and any portion of boat or motor. Turn motor from lock to lock in both the running and full tilt positions. Interference may cause damage in electrical cables or steering/tilting restrictions. Check operation of ignition/primer switch. Always run engine with a water supply for this test. With engine in neutral, turn key to "ON" position, push IN to activate primer. Turn key to "START" position to activate starter motor. As soon as engine starts, return key to "ON" position. Engine should shut off when key is returned to "OFF" position. Repeat the same test and check the emergency ignition cut-off switch. If one of the tests fail, recheck installation and correct as required.